Ahhhh yes! 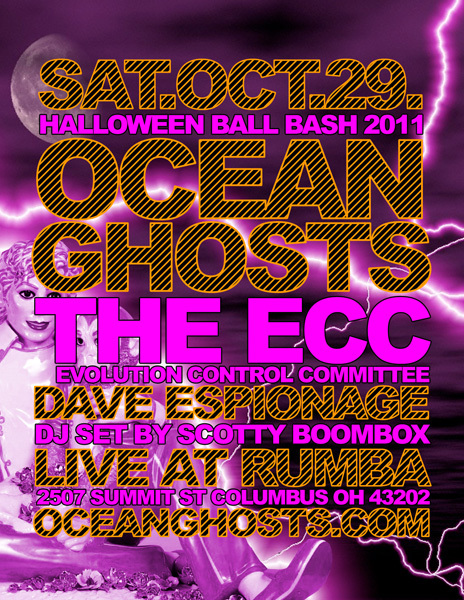 Now that ECC has relocated back to hometown Columbus Ohio it's high time that we had a big throwdown to celebrate -- and what better way than a Halloween show with old pals Ocean Ghosts! Thrusty Rhodes and Scotty Boombox will rock the stage with Dave Espionage for the Halloween Ball Bash 2011 Saturday October 29th. We'll get down 'n' dirty at the Rumba Café with lots of costumes (dress up, you!) plus drink specials ($3 extra-Bloody Marys; $2.50 PBR Tallboys)... what's not to like?? A good show to celebrate our return to Columbus... See ya Halloween Saturday! .:. Show archive and playlist now available .:. Once again the renegade Funketeer Marquis DuQue (aka Aeion Solar) joins TradeMark and Frilly for a funky Sound Of Plaid! On previous Plaid appearances the Marquis has dared all to FUNK OR WALK to Funk/Rock fusions, Japanese zaniness, and plenty more great jams. Join us all live on 2013.12.16 for madcap fun, wacky innovations and good music!